Jewelry subscription box Cate & Chloe VIP has the perfect gift just in time for Mother's Day, graduations, wedding season & more with their upcoming May VIP box. 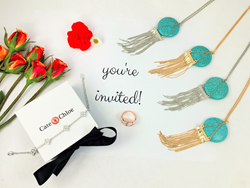 Cate & Chloe is sharing the perfect gift for the Spring season in their upcoming May VIP box! The trendy and sophisticated jewelry subscription box recognizes our constant need for celebration in the month of May! With a ton of reasons to celebrate including Mother’s Day, graduations, wedding season and more, they've curated the perfect gift box to fit the styles of the season. They're encouraging you to give the gift of fun and fabulous jewelry with the Cate & Chloe May VIP box.